For the first time in Israel, a bachelor’s degree program in Electrical and Electronic Engineering is open and taught entirely in English. Until now, the BSc in Electrical and Electronic Engineering available at Tel Aviv University (TAU) was an outside international program available at a higher cost to international students in Israel. Now however, both Israeli and international students can apply to the School of Electrical Engineering and take courses either completely in English or some in Hebrew depending on their preference. In light of this exciting change, the Israeli government will provide international students with the same benefits as the Israeli students in regards to tuition costs, making tuition about 1/3 of its original $15,000. Students from all around the world already joined the international school and launched the new academic year at Tel Aviv University in October. They are either Israelis or from over 100 other countries such as USA, India, France, Venezuela, Canada, China, South Africa, Guatemala, Japan, Mongolia and many more. This is an incredible opportunity for any candidate that always wanted to study Electrical Engineering in English in Israel. Our students’ background are vast: coming from high school, gap year programs, yeshiva, and even the army. The bilingual school represents the perfect solution for any number of students. “We take special pride in our international program in electrical engineering – the only such program in Israel to date – which attracts dozens of exceptional students from many different lands”, says Dean Rosenwaks. Another area in which TAU continues to lead among the institutions of higher education in Israel and the world is the hi-tech field. Located in the capital of the startup nation, Tel Aviv University couldn’t find a better place to offer its students a direct path to the industry. It is consistently ranked in the top 20 in the world and #1 in University/Industry research collaboration (Insead Global Innovation Index, 2018). Tel Aviv University’s Electrical and Electronics Engineering Program was always the perfect gateway to Israeli innovation. With its new bilingual school, it is now the ideal path to world innovation as well. 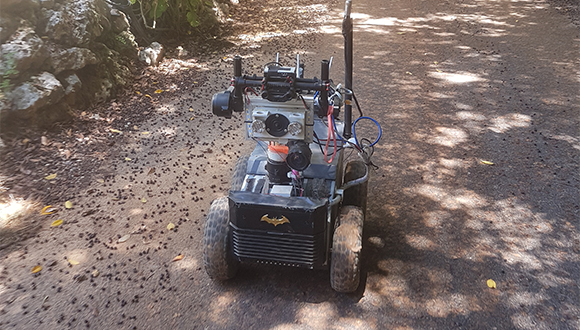 The “Robat” is a fully autonomous terrestrial robot with bat-like qualities that uses echolocation to move through novel environments while mapping them based only on sound. It was developed at Tel Aviv University. Bats use echolocation to map novel environments, navigating them by emitting sound then extracting information from the echoes reflected by objects in their surroundings. 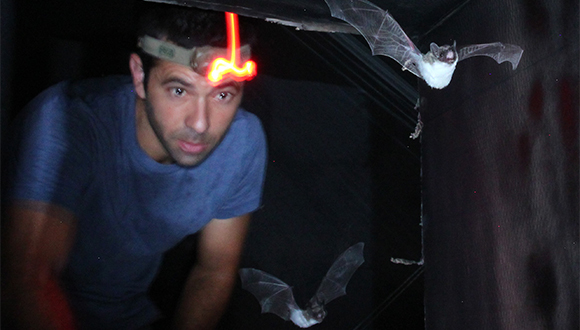 Many theories have been proposed to explain how bats harness sonar in order to navigate, but few attempts have been made to build a robot that mimics a bat’s abilities. A TAU study about the invention was published today in PLOS Computational Biology. TAU graduate student Itamar Eliakim developed a robot that uses a biological bat-like approach, emitting sound and analyzing the returning echoes to generate a map of space. Prof. Yossi Yovel of TAU’s Department of Zoology and Dr. Gabor Kosa of TAU’s School of Mechanical Engineering serve as Mr. Eliakim’s advisors. The Robat is equipped with an ultrasonic speaker that produces frequency-modulated chirps at a rate typically used by bats, as well as two ultrasonic microphones that serve as the robot’s ears. It classifies the borders and shapes of the objects it encounters with an artificial neural network, creating a rich, accurate map of its environment while avoiding obstacles. For example, when reaching a dead end, the robot uses its classification abilities to determine whether it is blocked by a wall or by a plant through which it could pass. Prof. Hadas Maman, Head of the Environmental Engineering program at TAU’s Faculty of Engineering, together with Prof. Mohan of IIT Madras in India, are looking for effective ways to prevent the contamination of groundwater and drinking water with runoff from open dumps in and around the city of Chennai, India. India is the world’s 7th largest country in area and 2nd largest in population. Over the past three decades it has undergone accelerated economic growth, including a rising standard of living, which, in turn, has generated increasing quantities of waste per capita. The systems managing solid waste – collecting it from the private and public domains, treating, separating, recycling and disposing of it by way of landfills or incineration – have not been adapted to the growing needs. The result of this situation is great environmental damage. Solid waste discarded as is, in its solid form, is undesirable. In India, open dumps are the most common method for disposing of municipal solid waste. This means that the waste is thrown into the dumpsite with no management or treatment whatsoever of the waste or its products. In most developing countries almost 90% of the waste is disposed of in dumps (Data from the World Health Organization). In many developed countries, on the other hand, sanitary landfills provide the ultimate option for waste disposal. The ongoing process of urbanization significantly increases the rate at which municipal solid waste is produced. This, in turn is a source of groundwater pollution from dump runoffs that seep into the soil. Interaction between waste and water, especially during the rainy season, or in the summer when fluids seep in from the dumps, generates extremely polluted wastewater called leachate. Leachates are highly toxic because they contain a liquid extract of waste substances, popularly termed ‘garbage juice’. Many different factors can impact the quality and quantity of leachate, including weather changes, how the waste had been deposited, waste management, compaction, type and composition, structure of the dumpsite, etc. Leachates contain large quantities of organic matter. Humic substances comprise a major group, together with ammonia, nitrogen, toxic metals, organic chlorine, phenol compounds, residues of pesticides and phthalates – chemicals used mostly as additives to plastic products, considered major pollutants by the US EPA. Physiochemical processes have been used successfully for the disintegration and removal of substances from stabilized leachate – as preliminary treatment before biological treatment. In particular, Advanced Oxidation Processes (AOPs) have been extensively used to completely remove various non-biodegradable organic compounds that may be toxic for microorganisms. The goal of the study is preventing the contamination of groundwater by leachate from open dumps in and around Chennai, and devising an economically efficient process that can be applied and managed by the local population. In this way we hope to minimize the negative effects of toxic substances penetrating the drinking water on the health of communities surrounding the dumps. Ultimately, we intend to establish a life-changing pilot program. The pilot, to be located at the dumpsite itself, aims to develop a sustainable technology that will combine oxidation (partial degeneration) and a biological process including green basins fed by the treated wastewater, to completely remove organic pollutants and chelate metals. The purified wastewater will be used for irrigation, and plants absorbing the pollutants will be used as fodder. Thus the combined process will both purify the wastewater and improve the social and economic conditions of village communities. In addition, the purified wastewater will be used for growing agricultural crops. “Safe potable water is a basic need. A suitable technology alone cannot solve water problems. We must also work together with the local society, so that the community itself is empowered by having potable water, and can independently manage its own water resources and make its own decisions. To create suitable conditions for implementing the technology we must also bring instruction and education, introducing introduce the environmental ideas around, water, energy, agriculture and food,” explains Prof. Maman, already on her way to India, to promote her life-saving project. It’s hard to imagine the world without electronics. Computers, smartphones, advanced commerce, medicine and transportation are all based on electronic systems and components. However, advanced electronic components and devices are prone to production defects and wear over time. This is the main reason for breakdowns after a while. Is it possible to design electronic devices that are not susceptible to wear and failure, and never break down? This question intrigued Dr. Yakir Hadad of TAU’s School of Electrical Engineering. Together with Prof. Andrea Alù and Dr. Jason Zorik of UTEXAS and Prof. Alexander Khanikaev of CUNY, he looked for a creative solution to the problem. As often happens, the idea for a solution came from a totally different direction – Materials Science. The Nobel Prize in Physics for 2016 was awarded to three British researchers for showing that properties of materials, for example electrical conductivity, can be preserved under certain conditions even when the shape of the material is significantly damaged. This wonderous capability stems from the material’s specific atomic structure and is closely connected to a mathematical field called topology. Topology deals with the geometrical properties of a surface or body that are preserved even when its shape is altered, as long as the deformation is continuous (with no holes formed). Topology attributes a topological number to every object, which essentially denotes the number of holes in it. The topological number of a soccer ball, for example, is 0. A cube and a glass (without a handle) also have a topological number of 0. Thus, in topological terms, these are all equivalent objects. A bagel and a cup (with a handle), on the other hand, have a topological number of 1 because they have one hole, and are therefore not equivalent (topologically) to a glass or a soccer ball. Consequently, it appears that if a topological number can somehow be attributed to a material, some of its properties will not change in case of shrinking, stretching or bending (namely defects), as long as its topology is preserved. This complex idea has been applied in recent years in various areas – optics, magnetism and more, to design and produce special devices that are immune to structural flaws. In the study published in March 2018 in Nature Electronics, Dr. Hadad and his colleagues demonstrated that a similar effect can be achieved in electrical circuits. Moreover, the immunity to defects can be induced by the electrical current itself as it runs through the circuit, by using the nonlinear properties of the circuit’s components (the components’ properties change in correlation with the current’s intensity). Based on this idea, the researchers designed and built an electronic device which, when a sufficiently powerful current runs through it, become essentially indifferent to defects. The researchers also demonstrated the operation of the device, showing that even when substantial defects were intentionally introduced into the structure, they had no effect on the circuit’s proper functioning. The study’s results open a window onto a new approach to designing more dependable, defect-resistant electronic devices, while demonstrating that combining ideas from different worlds and disciplines can lead to creative solutions for real-world problems.